Riptide GP shows just how much graphical power modern smartphones and tablets Which Tablet Is The Best For Gaming? 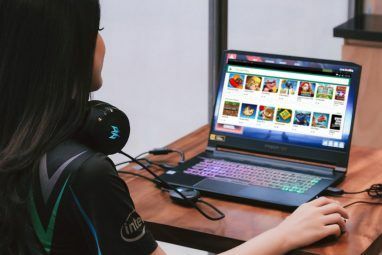 Which Tablet Is The Best For Gaming? Mobile gaming is kind of a big deal. 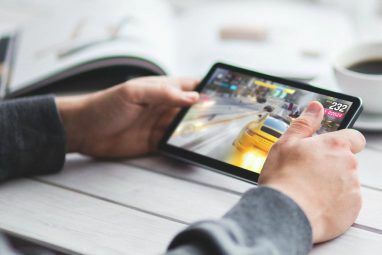 Most games available for tablets aren’t as long as the best titles for handheld consoles, but some are just as deep in both story and mechanics. As... Read More have. This game offers more than just great graphics, however – there’s a great racing game here. It even uses realistic water physics that affect the gameplay. You’ll need a device with some graphical power to really enjoy this game. We played Riptide GP on a Nexus 7 Get Your Tablet On: 11+ Epic Android Apps Optimized For The Nexus 7 Get Your Tablet On: 11+ Epic Android Apps Optimized For The Nexus 7 When Apple released the iPad Mini – jumping on board the 7" tablet trend pioneered by Amazon and Google – they said Google’s Nexus 7 lacked good tablet apps. While Android may not have the... Read More and the graphics were great – don’t let anyone tell you Android don’t have great games. This game is also available for the iPhone and iPad, although you’ll want one of the newer models to really take advantage of the graphics. You can get Riptide GP from Google Play, the iTunes App Store, or Amazon’s App Store. Riptide GP is a water racing game that’s billed as “console-quality”. If you’ve played Wave Race 64 or Wipeout, it will be instantly familiar. Choose one of seven different jet skis and race through 12 different courses, each part of a futuristic cityscape (there are actually six unique tracks, which you can also play in reverse. However, there are some different routes in the reversed tracks). The water doesn’t just stand still – Riptide GP offers realistic water physics with waves that move. Ski over the crest of a wave and you’ll fly into the air for a moment. When you hit the water again, it will splash and some will appear to be on the inside of your device’s glass screen – a nice effect. With the default control scheme, you control your jet ski by tilting your device, using it sort of like a steering wheel. 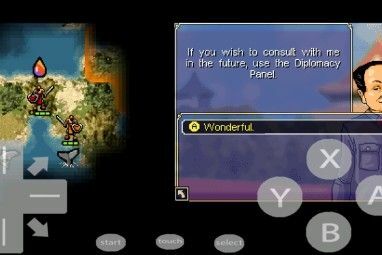 A tap on the bottom-left corner of the screen activates the breaks. If you don’t like this control scheme, you can also enable on-screen controls or use a gamepad. The game is optimized for the Sony Xperia PLAY and works with its gamepad, too. In addition to racing, you’ll often encounter ramps that allow you to fly into the air. While in the air, you can swipe the screen with your thumbs to perform a variety of tricks. Successfully performing a trick will help fill your boost meter – when it’s full, you can tap the meter to get a speed boost (complete with motion blur) that will allow you to pull ahead of the pack or maintain your lead. If the trick isn’t finished by the time you hit the water, you’ll fall off your jet ski. While you can get back on it almost immediately, you’ll lose precious seconds getting back up to full speed while the other racers fly ahead of you. The trick mechanic adds some depth to the game – no matter how well you do on a track, you’ll always be able to do one more trick or use the boost at exactly the right moment to improve your race times. Riptide GP offers a few different game modes, including a standard Race mode that lets you start a quick race on any track, a Hot Lap mode where you can challenge yourself to beat your best lap times, and a Championship mode where you earn medals and climb your way through the ranks. There are three different difficulties – 250cc, 500cc, and 1000cc. Once you master the tracks and get the controls down pat, you can move up to harder difficulties. What’s missing? Multiplayer would’ve been nice – this is a single-player-only experience, although you can view your friends’ lap times and challenge them on the leaderboards. More content would be nice, too – there are only six unique tracks and a few game modes. A stunt mode that allows you to use the tricks more would help round out the content. For a $1.99 game that you can play on the go, the game offers impressive graphics and great racing gameplay. The depth of content on offer here may not be completely console-quality, but the gameplay and graphics certainly are. Riptide GP is on our list of the best games for Android. If you use iOS instead, check out our lists of the best iPhone games or the best iPad games. Have you played Riptide GP? What did you think of it? Leave a comment and share your experience! Yes its a lovely game, but the other day I found the new nfs mostwanted for android posing quite a tough challenge for my xperia s.
Really great game. Its one of the first I've installed on my chinese Aurora II tablet, along with Beach Buggy Blitz by the same developer. The graphics are great. Though its optimised for Tegra GPU for extra effects, it renders well with clear textures, good frame rate and excellent control. Its addictive and playing this while on bus will surely make you look odd but its the game that counts. "don’t let anyone tell you Android don’t have great games. "